Welcome to my comprehensive resource site for the Sharp MZ-80A. Over time I’m hoping this will grow into quite a large catalogue of programming tips, games reviews & videos, manuals and other interesting historical information regarding this early ’80s computer. If it’s MZ-80A related you will certainly be most likely to find it here. Enjoy and make sure to check out the news section for what’s been added recently to the site! PLEASE NOTE : Some people have not noticed the menu bar at the top of the website and, I think, have only seen this page. Please remember to check the menu at the top of the screen which is where you’ll find all of the rest of the content of the site. As you will see when exploring the rest of my site, nowadays we can access a pixel via software if required. 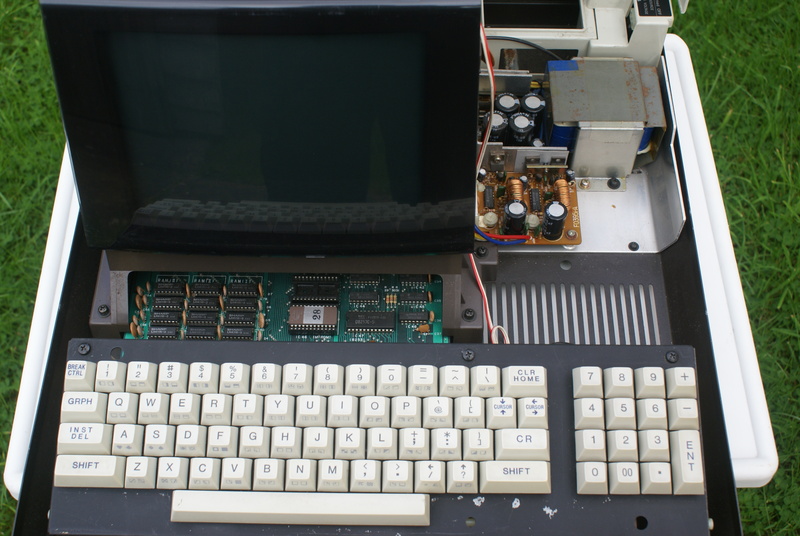 In truth, it is possible potentially to have the MZ-80A’s full resolution which is 320 x 200 ! 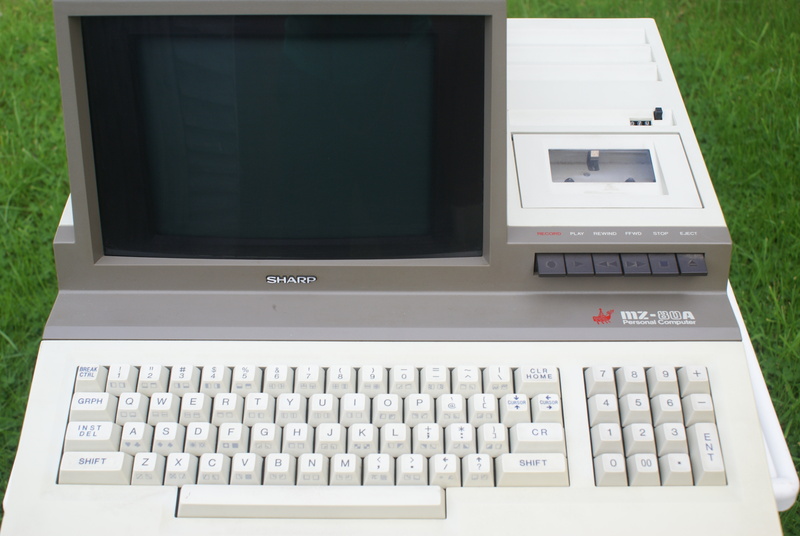 Welcome to my site dedicated to the Sharp MZ-80A. Why does this site exist? Not only has there been very little information regarding this excellent old machine on the internet up to now, including how to program it in a way to push it further than it has been before but even back in the days when it was still being sold in shops there was precious little support from the magazines of the time despite software houses such as Kuma and Knights of Aberdeen producing a lot of programs for it. 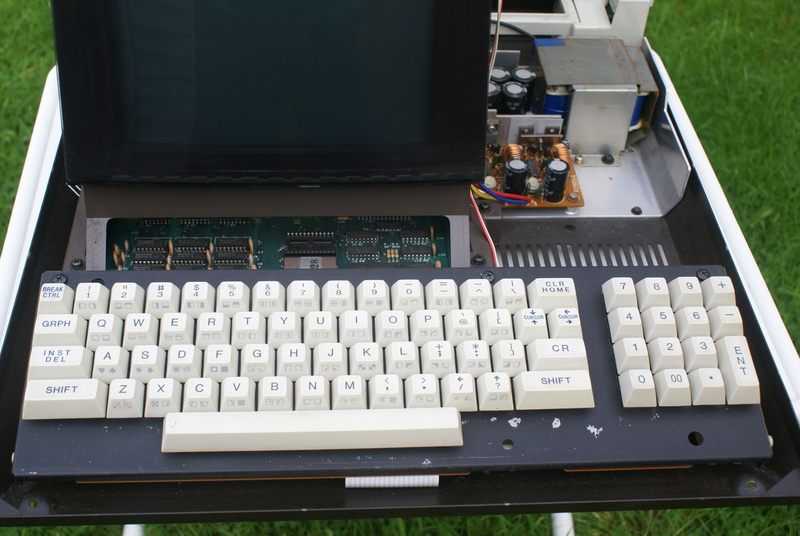 Most of the time it was the MZ-80K (which came out before the 80A) which got more attention. This you will notice in some of the archive material on this site. Luckily both machines are similar in a variety of ways. On a personal level, the MZ-80A was my 2nd home computer after the Sinclair ZX-81. I loved it at the time for many reasons, especially the sudden jump up from 1K (expanded to 16K) found on the ZX-81 to an amazing 48K, the fact it was a ‘clean’ machine which meant when you switched it on all of the RAM was available for use immediately (all you had was the Monitor kernel, no programming languages : you had to load BASIC from cassette tape for instance) and also, as a child, I loved the sleek design of the MZ-80A, it made me feel like I was on-board the Liberator from Blake’s 7 (my favourite sci-fi program as a kid) ! Finally, another reason for this site’s existence is that there is a lot of inaccurate information out there on a lot of ‘old computer’ dedicated websites which needs correcting. I also want this site to not only be as accurate as possible but be as comprehensive as possible. I enjoy sites like Lemon64 and Gamebase64 which provide as complete an archive as they can. Hopefully this site can be similar for the Sharp MZ-80A. So if you remember the old days of green screens, built-in monitors and “MONITOR SA-1510” then I hope you enjoy this site. Feel free to contact me via my Contact section. One of the items bundled with the MZ-80A computer was the software pack. This included a manual describing how to use the various bits of software and four tapes containing different types of programs. These were the Games, Education, Home Finance and BASIC Tutorial tapes. Below you will be able to find not only a scanned copy (PDF) of the Software Manual but also links (click on the photos of the tapes) to full downloads of the software. Great site. Loved my MZ80A which is still in my Dad’s loft somewhere. Thanks for commenting. Hope your MZ still works, it’s a great machine. If you ever need any tapes then contact me. On that note : Do you have any tapes yourself that you’d like archiving onto this site? It was my 2nd machine as a child (after the ZX-81). I have a huge soft spot for it also 🙂 I would be exceptionally interested in what tapes or programs or type-ins you may have! Any information to add to the archive is always greatly appreciated. Thanks for uploading my games Cursed Chambers and Quest and Alien Attack to youtube!! I wrote them when I was 16 and just showed them to my 13 year old son! That’s excellent, really great to hear from you too. I wonder if we have your complete collection here or not? Did you write anything else? Glad to find such active sharp MZ website. I don’t have a MZ80A, but a MZ80B and a MZ80A. I started basic programming in a MZ80B at school around 1981. I since have bought one for my 8 bits computers collection as well as the MZ80B. I still have my cassette of self programs, but don’t have the basic language cassette tape, would be glad to find one to revive my MZ, and tun again my old programs. I later had a Commodore 64 but never enjoyed it as much as the MZ. Hi Charles, glad you’ve found the site. I try and keep it as up to date as possible, although there has been a lack of recent news because we’re all working on our homebrew titles at the moment 🙂 You can find the SA-5510 BASIC (which came with the 80A originally) in the Programming Downloads section of my site. If you can find a way to transfer it to your Sharp then you’ll be fine. I use the software Audacity to load the WAV of the program I want to load (in this case BASIC) and I use one of those tape adapters you used to get for car stereos which allow me to play the WAV file of the software straight to my Sharp (from my laptop’s headphone socket). Only caveat to this is that you have to carefully remove the cassette deck’s lid on the 80A to fit the car tape adapter in along with its cable. If this is too much then send me an email I can probably send you a copy of BASIC on cassette. Hi! many thanks for this quick reply, I have found what obviously I need in the programming section indeed. Also as a hifi enthusiast I have all the equipment necessary to transfer the audio files to the sharp either by recording cassette tapes or using as you suggest a car cassette adapter as you suggest, also regular user of Audacity. No problem at all. Am always here to help out with MZ-80A stuff. Let me know if you get any difficulties with the above. I have found it much harder to get software to load when simply trying to record to cassette from a hi-fi separates tape deck. The car stereo adapter is far more reliable. Also, am always willing to supply cassettes myself if needed. Wow, brings back memories, My mum bought me one at auction in the 80’s since I wanted a computer but she wanted to see how I would get on with one. I had a tape which had the basic interpreter and a car sales program from a local garage which presumably was where it was before it was sold off. We spent a lot of time adapting basic games from books to run on it, thankfully the basic was very similar to Pet Basic so not to hard to adapt! A local Electrical shop even managed to find some games on tape for me. Good times! Thanks for your personal memories there, it’s great to hear from another MZ user. I wonder if you still have the machine or the games? Do you remember what games you had? I used it at the university with the Pascal Interpreter and Compiler. The compiler could compile on the cassette drive, so you don’t need to load basic first, just your compiled program. And I had a centronics interface for my star gemini printer. 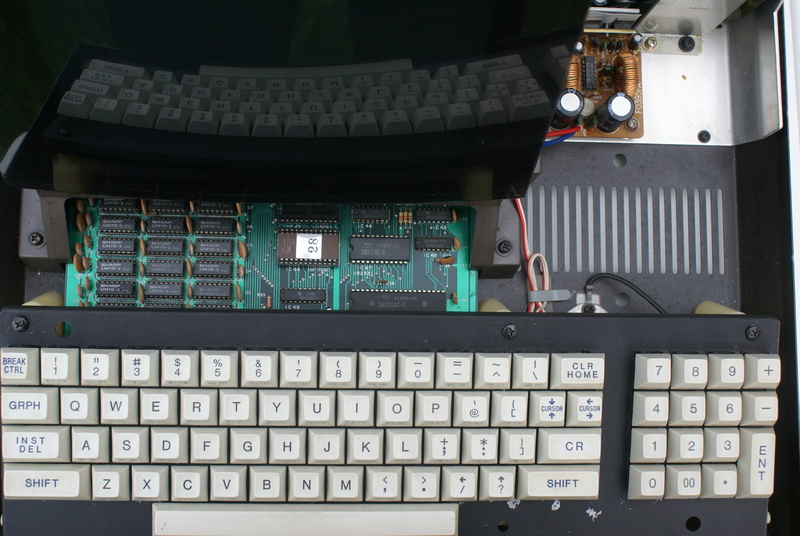 I learnt to program on a MZ-80A (48k) and spent many hours on it back in 1982. Still have all the manuals and numerous programming language tapes, including Fortran.. Assembly language, etc. Happy to send you pictures of what I have. Sadly all I have hardware wise is the motherboard which I was intending on framing in a double sided glass picture frame. Hi, thanks for commenting. Even better than pictures would be copies of the tapes if possible! We are trying to digitally archive and preserve as much MZ-80A software as we can. Let me know if you can help! Thanks! How do I get in touch / contact you…. pm ? Great machine and wote loads of programs for work on it in my youth.. Even contributed to the Sharp Users Club Magazine and was the MZ-80A sub editor and librarian for a while many moons ago. Still have a box full of floppies with stuff I wrote. I’m looking for a complete working MZ-80A system including dual floppies and P5 printer in the UK if anyone has any leads. Thanks for the comment! eBay is usually a good bet for these things although floppy drives are very hard to come by now. You would be best speaking to the SUC as it still exists! I would love to port my games to the MZ series. Only problem is my games require much more than 48K. They normally work off of bank-switching cartridges or floppy disks. There’s no bus connector for these for connecting up a cartridge ROM, right? Since the floppy disk drives are so rare, has anyone come up with an adapter for SD or to use a modern computer as a disk drive, as has been done with other platforms? I’m in the US and these systems were quite rare here–I’ve only seen them online. There are currently some projects which various people are involved with. You may want to check out some of the MZ Facebook groups if you’re on there for more info. I believe there is a way of using SD cards with the MZ machines but this is a fairly recent discovery.